Just bought a Lamborghini Aventador? You might want to keep hold of the receipt as Ford has just unveiled its all-new GT supercar. Stunning the assembled crowds at the Detroit motor show with a surprise reveal, Ford lifted the covers off what is only the second GT road car in its history. The first, released in 2005, was a retro-throwback – a near verbatim copy of Ford's GT40 Le Mans racer of the 1960s. This new model, however, is a completely fresh design – though it has the same brief as the iconic racer: give the established European supercar players (that's you, Ferrari) a bloody nose. From the front, the new model is instantly recognisable as sharing the GT's design DNA, with a wide nose and large headlamp clusters. From there back, however, the design is completely fresh, with its flared width, active rear spoiler and high-mounted, rifled exhausts giving a more futuristic aesthetic. Open the scissor doors and the two-seat cockpit is a similarly sci-fi take on a race car's cabin. Many of the functions are operated by the quartic, F1-style steering wheel, while the digital instrument display can be configured to the driver's own tastes. Due to go into production late in 2016, the GT is a full-on supercar, with a mid-engine layout and a race car-style carbon fibre tub. Carbon has also been used for the body panels to save further weight. In tune with today's motoring climate, the new GT eschews the large, thirsty V8 motor of its predecessor, and instead uses a 3.5-litre twin-turbocharged EcoBoost V6. 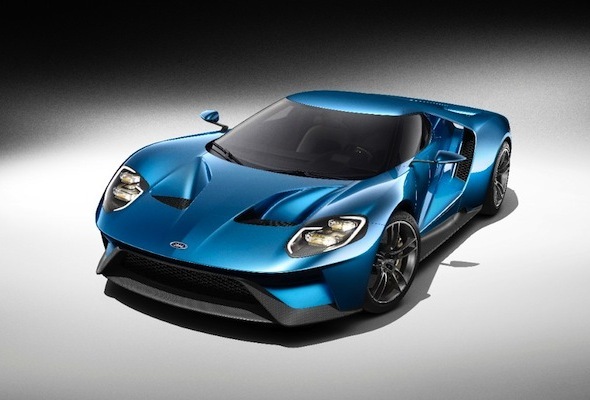 Don't worry about it lacking punch, however, as Ford has confirmed it will have 'more than 600 horsepower'. Power is sent to the rear wheels via a seven-speed twin-clutch automatic transmission. The GT's unveiling has fuelled speculation that Ford is planning a return to the Le Mans 24hr in 2016 – in what will be the 50th anniversary of Ford's victory at the Circuit de la Sarthe. "The GT is the ultimate execution of an enthusiast supercar," said Raj Nair, Ford group vice president, Global Product Development. "GT includes innovations and technologies that can be applied broadly across Ford's future product portfolio." Full price and specification details are yet to be announced, though an eye-watering list price of around £250,000 is already being mooted, with production numbers likely to be strictly limited. Further information will be available closer to the GT's launch.